River water is mainly contaminated by physical and biological impurities consist of Totals suspended solids, turbidity, bacteria, virus, algae etc. which need to remove before supply and distribution of river water for various uses. River water treatment is the process of removing contaminants from flowing or stagnant river water which includes physio-chemical treatment of water with the combination of conventional and advance treatment process like coagulation, flocculation, clarification, settling, filtration and disinfection of filter water to produce an environmentally safe and pure water suitable for drinking and multiple uses in domestic, institution and industrial application. 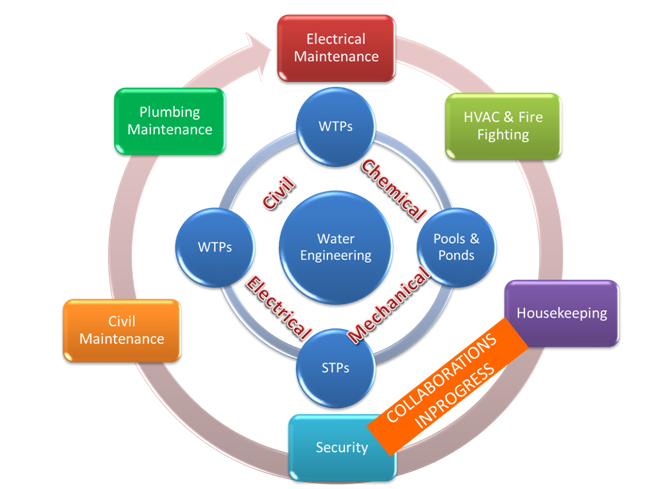 Shubham is a leading EPC contractor; provide turnkey solution to municipal bodies from concept to design, supply, install, commissioned and operation & maintenance of River Water Treatment facility with the combination of various technologies at the most comprehensive, cost-effective and reliable practises. We have more than seven years of extensive experience in River Water treatment. We, constantly meet with a diversity of water-related challenges. This has provided us with an unsurpassed bank of knowledge. We provide Municipal River and Lake Watertreatment plant with innovative solutions for effective use of treated water in many process applications by ensuring required quality. Sewage treatment plant for municipal & government is a process of Sewage collection from city and other inhabited areas, through interconnected network of sewerage lines and disposalto centralize sewage treatment facility to protect public health and prevent diseaseas well as water pollution from sewage contaminants. Apart from public health and pollution norms, STP facilities has also becoming new source of water which can be used for irrigation, horticulture, industrial and many other non-potable purpose. Recycling of sewage treated water directly reduce consumption of fresh water and help to come out from water scarcity problem. Sewage treatment is the process of removing contaminants from domestic wastewater called “Sewage” coming from various part of city and inhabitant area, which includes physical, chemical and biological processes to produce an environmentally safe fluid waste stream (or treated effluent) and a solid waste (or treated sludge) suitable for disposal or reuse (usually as farm fertilizer). Various technologies from Oxidation pond to Activated sludge process and advance MBBR to MBR process has been adopted by municipal and government bodies to provide effective treatment of domestic sewage water depending upon the uses of treated sewage water. Shubham is a leading EPC contractor; provide turnkey solution to municipal bodies from concept to design, supply, install, commissioned and operation & maintenance of Sewage Treatment facility with the combination of various technologies at the most comprehensive, cost-effective and reliable practises. flocculation/precipitation, membranes for advanced filtration, De-chlorinationand reverse osmosis. Swimming is one of the most popular sports in world which is a great way to keep fit & stay health. Swimming is a healthy activity that you can continue for a lifetime. It is a low-impact activity that has many physical and mental health benefits. Nowadays India is also pushing and promoting swimming Pool sport across the country and also provide grant for construction of swimming pool through sports authority of India (SAI) to provide world class facility for swimming at various cities and town where every person can get benefited Shubham is a leading EPC and turnkey swimming pool builders & contractor provide solutions from conception to completion of various type, size and volume of swimming pool which require exacting precision, and when the construction schedule is demanding, this can be guaranteed only by modern and accurate technologies. Our expertise in construction of Olympic size of swimming pools for municipal and government bodies is determined by our know how in water treatment & chemistry and considerable experience in onsite construction & execution make Shubham one of best choice when things come to swimming pool construction. Our pool O&M services can be utilized year-round to ensure your pool is perfectly maintained without any additional time or attention required on your part. So why not consider one of our weekly, monthly or annual maintenance contracts that we offer at competition swimming Pools to ensure you can enjoy your Swimming pool each and every day. Shubham is committed to provide flexible, integrated, dependable, cost effective and responsive solutions for the Operation and Maintenance requirements catering wide range of Water & Wastewater products as mentioned earlier. We undertake Annual Maintenance Contract (AMCs), Operation & Maintenance (O&M) Contracts of all high capacity Water & Waste Water Treatment plant.